Depression and anxiety are both common mental health conditions that can occur separately or together. According to Aware, approximately 450,000 people in Ireland experience depression at any one time. In this section you will find reporting guidelines relating to depression and anxiety, along with definitions of these conditions. Always include contact details of a support line for those impacted by the article or programme. ✘ Avoid using language such as ‘madman’, ‘crazy’, or ‘lunatic’. These terms further stigmatise those living with mental health issues. Avoid linking depression and violence. It has been proven that a mental health diagnosis is not a predictor of violent behaviour. Drawing this connection can add to the stigma which targets people living with these conditions. Frame your discussion of medication with caution. Never encourage readers to stop taking medication without medical supervision. Always back up claims about medication effects or side effects with a quote from a qualified mental health professional. Avoid sensationalising depression, anxiety, or other mental health issue in the headline of an article. Some people may not want their diagnosis discussed. Include comments from a mental health professional or organisation. Include comments from a person living with the condition in order to ensure accurate and balanced reporting. Where possible, try to include positive stories of people living successfully with depression or anxiety. Use of stereotypical or negative stock imagery. Consider any images being used, such as someone pulling their hair, or a person in a straight jacket. Are they necessary or negative, as negative images can further perpetuate stigma. 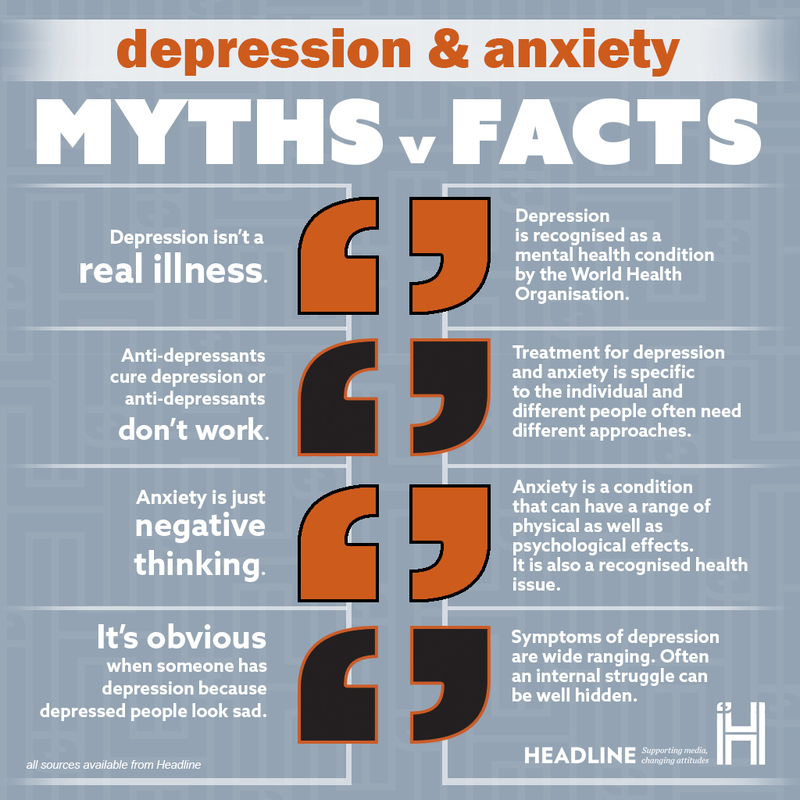 Aim to challenge commonly held misconceptions about depression and anxiety. Examples of these can be found in our Myths and Facts on this page. Depression is a common condition that causes people to experience depressed mood, loss of interest or pleasure, feelings of guilt or low self-worth, disturbed sleep or appetite, low energy, and poor concentration. If depression becomes chronic or recurrent, it can cause considerable impairments in the ability to take care of daily responsibilities. Depression occurs in persons of all ages, genders, and backgrounds. It affects approximately 121 million people worldwide and is a leading cause of disability. Depression can be reliably diagnosed and successfully treated, although fewer than 25% of affected individuals have access to effective treatment. Also called postpartum depression, this condition impacts women around the time of child birth. Some women can be affect by perinatal depression, which occurs during pregnancy. These conditions are characterised by extreme sadness, anxiety, changes in appetite, loss of interest or pleasure in life, and lack of interest in the baby. Perinatal and postnatal depression are different to the ‘baby blues’. Anxiety is a feeling of worry or fear that can range from mild to extreme. While everyone can feel anxious at times about situations such as an exam or an interview, people with anxiety disorders can find it hard to control their worries. Feelings of anxiety and distress can often impact their daily lives. Anxiety can also be the primary symptom of conditions such as panic disorder, agoraphobia, and generalised anxiety disorder. Agoraphobia is a term used to describe several related phobias that are connected to situations such as leaving home, being in crowds or public spaces, and travelling alone on public transport. Many people with agoraphobia also experience panic disorder, but not all. This condition impacts twice as many women as men, and the HSE estimates that approximately 4% of women and 2% of men are affected by agoraphobia in any 12-month period. Seasonal Affective Disorder (SAD) is a form of depression that recurs during the changing of the seasons. It is most common in winter although it can also affect some people during spring/summer. The HSE estimates that SAD impacts approximately 7% of the population. Similarly to depression, symptoms can be difficult to live with. Treatments available include light therapy, talking therapy, and medication.